Generally, logical corruption in MS Exchange databases surfaces at the database level. A particular example of this type of corruption is a situation when the index entries refer to missing values. It may also happen at the application level causing damage to your mailboxes, folders, messages, or attachments. Logical corruption occurs either in the Information store or database engine, resulting in some serious damage to your Exchange mailbox data. A 'bad page link' may be caused by a severe disk crash or a bug in Exchange. This is also seen when you try to replay incorrect transaction log files after restoring your database from a backup. Take the most recent full online backup before the time you receive the above error in your Application log and use it to restore your Exchange Server database. Replay the log files after restoring from the tape backup. Now, use 'ExMerge' tool to export all the data of user mailboxes and import it back to a newly created mailbox store. Use 'EDBUTIL /D' to perform an offline defrag. This may delete the bad page link from your database. Run the Exchange Administrator program and try to move all users from your Exchange Server to another server running Exchange using the 'Move Mailbox' feature. Next, recreate the mailbox store on your Exchange Server and move all users back to this server. 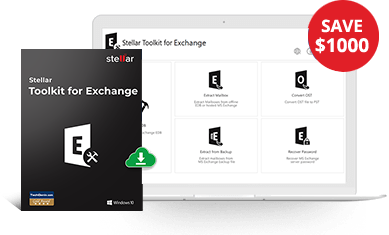 Stellar Repair for Exchange restores mailboxes as Outlook .pst files at any desired location of your choice. Moreover, the software supports MS Exchange 2019, 2016, 2013, 2010, 2007, 2003, 2000 and 5.5.